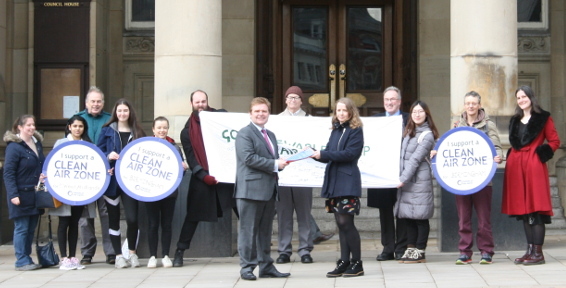 It’s been a couple months since Councillor John Cotton handed our petition for a city wide Clean Air Zone to full council, and from the outside it may look like the air pollution campaign has gone a bit quiet. It’s true that in the run up to any local election, campaigning on local issues can be tricky. There is uncertainty surrounding which councillors will re-run and which new candidates will put themselves forward. Councillors can be reluctant to answer difficult questions on controversial topics, and of course we have no idea what our council will look like after May 4th. The council won’t give us any clues as to what the Clean Air Zone might look like until after the election results are announced, so lobbying has inevitably come to a temporary pause. Despite this, the air pollution working group have been as busy as ever. When external drivers like local elections put a pause on campaigning, there is still a lot to be done to keep things ticking over and ensure that the group is poised for action when things kick off again. With their September deadline just around the corner, Birmingham City Council don’t have much time left to finalise their plans for the Clean Air Zone, so we need to be ready to spring into action as soon as the elections results are announced. In addition to this, we have been thinking about how we can use Clean Air Day on 21st June to further our campaign objectives. Over the next couple of months we expect things to very busy as we react to the election results and build this into our campaign strategy, keep our eyes peeled for a possible public consultation on the Clean Air Zone and finalise our action plan for Clean Air Day. There is never a better time to get involved with the air pollution campaign. Whether you are interested in policy and the council’s plans for the Clean Air Zone, or if arts and crafts are more your thing, and you would like to help build props for Clean Air Day. Either way, keep watching this space for details of how you can join a momentous push for change as Birmingham City Council plan our Clean Air Zone.